People born specifically on the 15th of April are surmised to be independent and intuitive but noticeably more stubborn than the majority of other rams. The ruling astrological planet allocated for this particular day is Venus contributing youthful grace and expressiveness to your probable attributes. If you have this birthday ambition, charm and diplomacy give you superb social skills and the ability to face challenges head on. Home loving and family focused you will usually enjoy entertaining and have an appreciation of natural and beautiful things. You are assertive but not overly so with a practical efficiency and a down to earth approach. Individuals with an April the fifteenth birthday are realistic in their views although occasionally a little moralistic. You can also be inclined to take yourself a bit too seriously. Perfect work choices to a person born on the fifteenth of April are those where there is a harmonious atmosphere. You are not particularly fussy about the sort of job title or task involved as long as it is within a happy environment among likeminded others. You possess high levels of creativity and this talent often leads you into advertising or design type occupations. Monetarily you are usually uncannily fortunate and being quite adept at planning and resourceful budgeting helps. You ordinarily have enough patience and self control to be able to save up for large purchases rather than relying on credit. For an Aries, the person born on the fifteenth day of April is untypically emotionally sensitive and tactful for this zodiac sign. Although you need some degree of emotional independence you much prefer being part of a couple within a soul mate relationship. An ideal partner will share with you an intellectual as well as physical rapport with the same quick wit and enthusiasm for romance. In a long term partnership you like to take the lead but every now and then will get a kick out of being seduced too. Your sensitivity, willingness to compromise and tact usually ensure that love relationships are not commonly problematic. Once committed to someone you are as a rule intensely faithful and devoted but likely to be susceptible to jealousy. This insecurity can cause you to be sometimes a little too critical and excessively demanding of a partners attention. 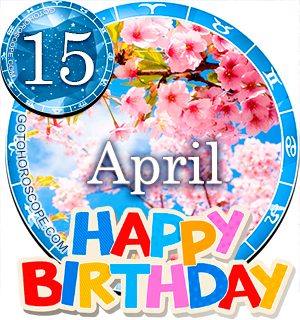 Health problems experienced by those born on April 15th are usually few and minor as you are disposed to robustness. This healthiness may diminish however if you succumb to your preference for a sedentary lifestyle and fail to take adequate levels of exercise. You have a hearty appetite so lack of activity can see you suffering from lethargy and soon piling on the pounds if you are not careful. People born on this day generally require a varied diet and should perhaps avoid over processed unhealthy foods. Drinking the recommended daily amount of water could also be markedly important for your general well being. The main strengths in your characteristics are displayed in the ambitious, organized and charming temperament you own. Positive qualities like these along with your receptive intuition help you gain the things you desire in life. Recognizable personality weaknesses for those born on April 15th focus on your increased stubbornness. This negative side to your character can take the form of self involved selfish behaviors and a judgmental attitude. These flaws in your personality tend to occur more often in circumstances where your emotions or pride have been hurt and you are feeling betrayed. Being born on the 15th of April usually bestows you with a goal orientated mentality that tends to kick in as you mature. In your youth you are likely to be unsure of the directions you wish to go but as you grow older aspirations seem to become more focused. Your realism and ethical viewpoint are excellent guides that help you discover the quickest and honest routes to success. When dreaming many of the dreams you have will feature your yearning to be loved and appreciated. These wishes are inclined to interfere with plans for professional achievements if you are unable to find a fair balance. As you were born on the fifteenth day of the month the total of your birth date figures results in a Root number of Six. This numerical reference to your birthday has the keyword 'Social' highlighting your perceptive skillfulness when socializing. The 15th card in the Major Arcana, the Devil is the Tarot symbol connected to your birthday and its meaning is simply an indication of your requirement for emotional security. It emphasizes the anxieties you may have in this area. The lucky gemstone for April the fifteenth birthdays is believed to be Turquoise promising clarity of mind and a sense of calmness. The celestial body Mars is imagined to be the most powerful cosmic influence astrologically in determining Aries personalities. The actual day you were born on, the fifteenth of April is governed by Venus's energies making a combination of 2 planets mainly responsible for your uniqueness. Your eloquence, practicality and assertiveness allow you to be purposeful in your actions and thoughts and make steady progress. Your level head and modern outlook help you to view everything realistically and this comes in useful for good decision making. It should prove beneficial personally if you can conquer your penchants for laziness and selfishness as these tendencies could prevent you reaching your full potential. A final applicative thought for people born on April the 15th concerns patience. The most advantageous stance you can adopt is to always let things happen naturally and try to refrain from anticipating or pushing outcomes. SO nice to meet other April 15th's!!!! I have never met anyone with my birthday. Those of you in the US are you tired of the Tax Day jokes? Oh yeah...... Happy Birthday all!!!!! from the 1975 model!!!!! 4-15-1959, never have met another person with my b-day. I was born on15 April 1958.l like the prediction. I'm not sure. I'm 15.04.1990. it feels dat some of aries & some of scorpio matches my character. Wooooooooo! Thank god i found more people like me! Very true wonderful awesome.... Same as i am. Exactly what I am, so stubborn.